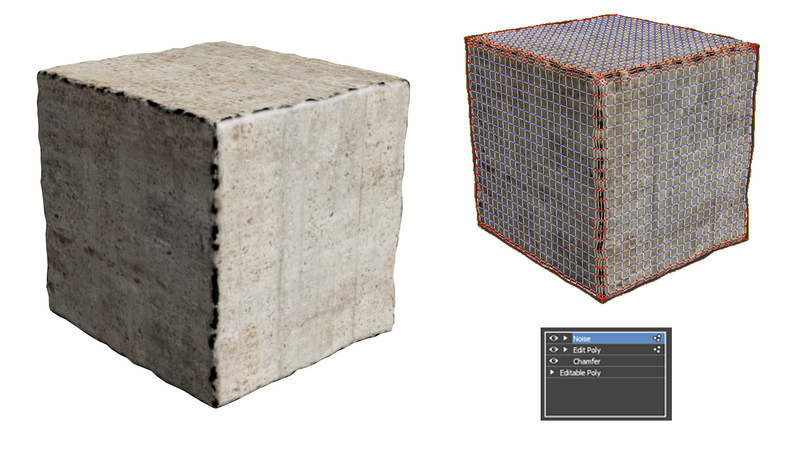 With this tool user can deform selected edges of Editable Poly objects. This will give your model a more natural look with raw edges. For example: wooden or concrete pillars or walls, pieces of clay or ice, rude metal etc. as Editable Poly object with none modifiers assigned). two faces who share same edge. process by pressind *Defor Selected Edges* Button. direct feedback of any changes on your model. increase or decrease spinner value only by one. and 3dsMax 2012 x64, but it may work in older version. NOTE: To disable bevel option just set *Bevel Height* value to ZERO. - added Preview Checker Map options for cheking the model UV's. Submitted by fede4383 on Tue, 2018-07-17 07:36. I was wondering how to add it on a toolbar button? Submitted by brainsgonedead on Wed, 2016-11-09 16:13. Results are not that great and can be done in 3 simple steps! I tried this script and it did not give good results and is a bit slow and has issues with undoing (history mode). Submitted by JakubCech on Thu, 2016-11-03 13:13. I would love to ask you for improvements - these are my suggestions! 1. ma deform edges a modifier without the need to have object converted to edit poly (not destroying stack). 2. Make "bevel" function edges orientation aware - so when there is "bevel" being applied on an architectural column and lets say ceiling - its working on 90 and 270 degrees edges according to normals. So there is no need for 2 passes. 3. Make created corner quads! Actually this script is making corners look very wierd. Let me know what you think and if I am missing something that is maybe already applied. Submitted by MaximuM on Tue, 2015-09-29 01:39. Very useful script, thanks a lot ! Submitted by artrager on Sun, 2014-04-06 19:39. Works great! I will use this all the time, a much needed tool for stonework. Thanks! Submitted by barigazy on Fri, 2014-03-21 03:23. Submitted by bathyscaph on Thu, 2014-03-20 11:15. I've only wanted this for forever . . .
. . . very clever tool. Thanks for sharing! Submitted by james88 on Sun, 2014-03-09 08:29. Submitted by barigazy on Thu, 2013-07-11 01:31. Yup. I agree with that, probably in the next update. Submitted by rs3d on Wed, 2013-07-10 15:25. A modifier would be great!